Maarten is 21 years old and lives in Tervuren, close to Brussels. In June 2019, he will graduate as a Bachelor student in Business Management with Accountancy and Taxation as a major. Last year, Maarten participated in the International Businessweek in Lahti, Finland. The program of the week was built around a business game called Global Challenge. The great experience Maarten had in Finland is the reason why he wants to participate in the NIBS case competition. After this competition, Maarten will start his internship at SBB, one of Belgian’s largest companies in the Accounting industry for entrepreneurs. In his professional career, he wants to support entrepreneurs who want to grow their business. Gunnar is 23 years old and was born in Leuven, Belgium. Gunnar is a senior Bachelor student in Business Management with a major in Marketing. This spring, he will do his internship at Propaganda, a Belgian marketing agency specialized in internet and new media. Next June, he will obtain his bachelor’s degree. In his leisure time, Gunnar likes gaming, playing guitar, basketball, and cycling. Gunnar possesses leadership skills and is a flexible team player that enjoys taking initiative. Gunnar’s main goal is to succeed in the competitive marketing world. Lotte, 21, is a Belgian student eager to grow in the field of Human Resources. She sharpened her professional skills at her traineeships at IKEA Belgium, IPN Brainpower Vancouver (Canada), and summer job as a HR consultant at the recruitment company Job Talent. She was active on the fields of recruitment, social media & marketing, business development, headhunting, training & development, and leadership research. 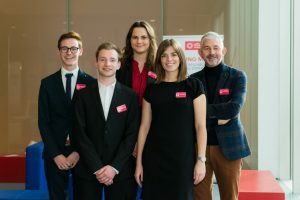 Lotte is active in many social activities like youth movements, Youth Red Cross, fencing, Red Cross, and the Student Council at UC Leuven-Limburg. Currently, she is studying Advanced Business Management with a major in International Management. She will start her Junior consulting project in February and will graduate in June. Lotte is motivated to grow in Business Management and hopes to set up her own company. Kare is a 22-year-old student from Belgium. Currently, she is studying Advanced Business Management with a major in International Management at the UC Leuven-Limburg. Last year, Karen did an internship at Hill’s Pet Nutrition in Kansas, USA, and at Millibeter in Belgium. It was a great opportunity for her to get her first experiences as a marketer consultant. Next month, Karen will start on a new project for the marketing agency STRAREX in Antwerp. As a child, Karen was involved in many social activities like youth movement, dance, tennis, and art classes. Currently, she is a member of a sorority in Leuven. In her free time, Karen does a student job for a catering and a cool lunch bar in Genk. They are really pleased to have her and she loves working because of the nice colleagues she has. In the future, she would love to grow and develop her skills as a marketing consultant. Mario has been working at UC Leuven-Limburg for 26 years. He is lecturer and his main subjects are Market Research, International Marketing and Business Consulting Methods. Furthermore, he coaches several student projects, is a study trajectory coach, and internship mentor. As staff member of the International Office of the Faculty of Management, Mario coordinates the Exchange Study Program for incoming students. He also organizes the annual International Marketing Week and supports students in their search for master studies abroad. His main hobbies are jogging, traveling, photography, and reading.